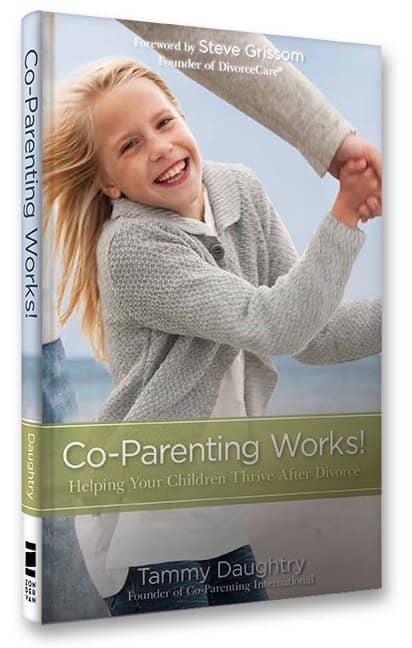 The followings videos introduce parts of the book “Co-Parenting works!” which explains you how to deal with co-parenting. About the author: Tammy Daughtry, author, speaker, advocate, is the founder of Co-Parenting International. She holds a Masters in Marriage and Family Therapy and has over ten years experience in real-life co-parenting. Co-Parenting Works!What is the book Co-Parenting Works! about? Is it right for you? What will the stories be like and what will you learn? This videos answers those questions and begins your journey of hope in co-parenting. Co-Parenting Works!Explore the beginning of the journey, the first year after divorce and during separation. No matter where you are in your co-parenting journey, you can get stable and you can move forward…your kids need you to. Watch this video to get an idea of what’s behind this section in the book. Co-Parenting Works!Did you know there are six risk factors with divorce? Co-Parenting Works!helps you work against the statistics and change the predictable outcomes. Part 2 of the book expresses the heart of CoParenting International. Watch this video to get a snippet of what to expect. Co-Parenting Works!We are going to challenge you in this part of the book to become a team with your ex for the sake of your children. The two of you must come together as a team for your children like an executive team does for a company. In this video meet Tammy’s now Husband, Jay Daughtry, and hear his perspective on what it’s like to see a healthy co-parenting relationship work. Co-Parenting Works!Hear from Tammy’s now husband, Jay Daughtry, introducing the topics discussed in Part 4 of Co-Parenting Works! Things like handling the tougher aspects of working with an ex and extended families. Often these are the first things that come to mind when dealing with the other co-parent. This section will help the two of you get onto the same page and not have to worry about what your children hear on the side. Co-Parenting Works!Jay Daughtry, Tammy’s husband, introduces Part 5 of the book on how to parent your child when the other parent is no longer part of your child’s life. Learn how to talk about the absent parent, how to surround yourself with a supportive community, and how to determine when an ex is unsafe for you and your children. Co-Parenting Works!Part of moving on with your life after divorce is dating. How do you introduce this to your kids and talk about this with your co-parent. We’ll also talk about a hope chair. You may have fears about this. What’s healthy? And what about even further…remarriage? Jay and Tammy introduce these topics in Part 6 and help you think through remarriage, heal from divorce, and make a great decision for you and your children. Co-Parenting Works!Co-parenting does not end when child support ends or at age 18. Your children need you in their life forever. They will get married. Someday you may have grandchildren. There are decisions you will have to make with your co-parent. Part 7 is about making the right decisions through lifetime for you and your children.